Tackling big projects around our house happens like this. I see something and it bothers me. Maybe a bit of paint is chipped, or the fence is looking tired and dirty. I start thinking about how to fix it. I think about it every time I see the thing and start planning. Then when I get the trifecta of good weather, time and energy, I get to work. This is what I've been working on over the last 24 hours... staining our deck. 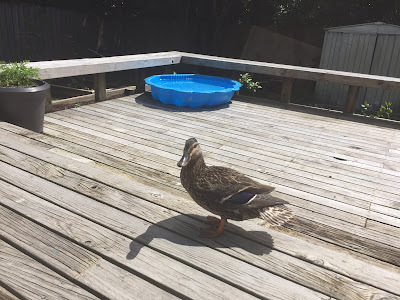 When we bought the house, the deck had just been water-blasted so it looked nice and clean, but over the past ten months it has started to fade and look dingy. Deck before I stained it. 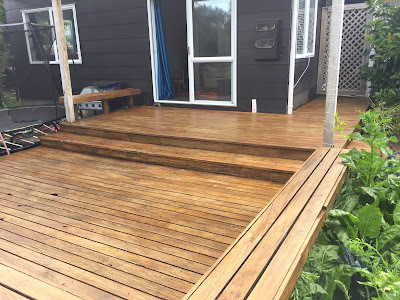 I didn't want to water-blast the deck again because that can wear away at the wood and cause splinters, I wanted to improve the way the deck looks while also protecting it from the elements, which is why I went for deck stain. First I cleaned the deck with a special deck cleaner, although that didn't seem to do much. Then I sanded the deck with our electric sander. Then I swept it clean and stained it with a long handled deck stain applicator. Today I've been filling in the cracks between the slats with a brush. I've still got to do all the roof beams and posts, but may need to water-blast them before I do as it will be too hard to sand up high. The colour I chose was Rustic Oak. 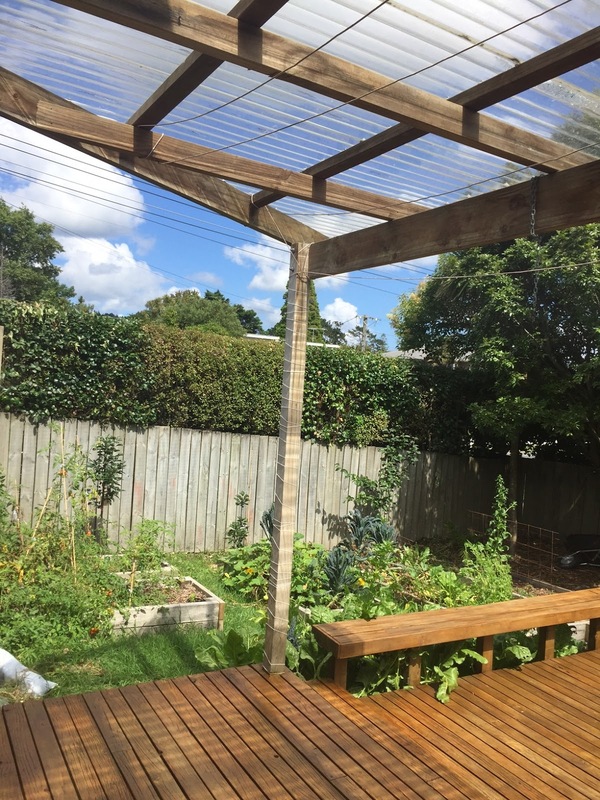 I've been eyeing up fences and retaining walls over the past few months, trying to settle on a colour I liked. 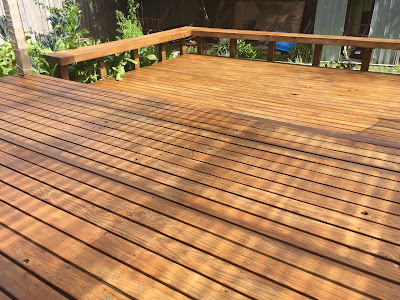 I didn't like any of the orange or red based stains I saw, and I thought dark stains like Blackbean would be too hot on our North facing deck, so I needed something lighter. The yellow-based stains I saw appealed to me so I took a photo of a retaining wall I liked the colour of and brought that photo into Bunnings to pick out the stain. Rustic Oak seemed to be the closest match. I'm aching everywhere and covered in deck stain, but it's totally worth it. I'm so happy with how the deck has turned out. It looks new again. 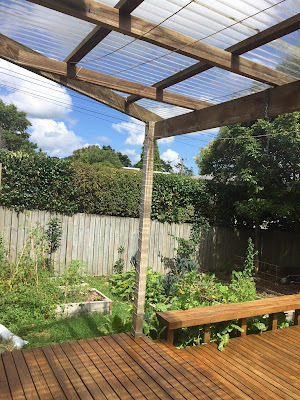 You bet I'll be noticing those raised beds and deck posts every time I see them and thinking about when the next burst of energy will take me so I can tackle them too. Not today. Today I'm heading for a hot soak in the bath with a beautiful Bath by Amy bath bomb. I can't imagine doing it in your kind of heat. It would dry before you even slapped it on.